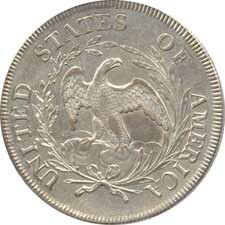 By contrast to the small date/small letters sub-type, 1796 dollars of the small date/large letters type are the most readily available dollars of the year. However, the description "most readily available" is truly a relative term, as all dollars of 1796 are vastly scarcer than their 1795 Draped Bust counterparts. 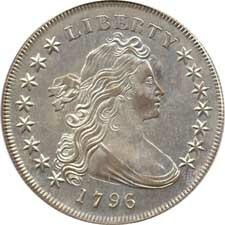 With fresh dies seeing their first use in coining specimens of the BB-61 variety, coins of this type are apt to display the best strike of any 1796 dollar. Yet, weak luster is still commonplace for these. Another AU58, the Cardinal Collection specimen ranks as the third finest known of the sub-type, with only two mint-state specimens known. Powerfully struck throughout, the Cardinal specimen displays the intended design to its maximum advantage, with all of Liberty's hair strands fully raised, rounded and separated, every obverse star full and complete to its pointed center, and all but the top of the eagle's leg showing full feathers in raised relief. The surfaces are mostly untoned with prooflike flash. Just the ever so slight suggestion of rub keeps this coin from Mint State.